Gain access to specific data, methods and instruments not available in the home institutions/organisations. Perform collaborative research leading to joint publications(s). ·Applicants must be engaged in an official research programme as a PhD Student or can be employed by, or affiliated to an Institution or legal entity, which has within its remit a clear association with performing research. PhD students and Early Career Investigators (ECI) (up to 8 years after the date of obtaining the PhD/doctorate, full-time equivalent) have priority. Senior scientists are also eligible for STSM. Researchers are eligible to receive a STSM Grant if the country where they hold their primary affiliation is ENOVA member country (listed here) and STSMs should be between two different ENOVA member countries or between a ENOVA member country and an International partner country or a Near Neighbor Country. However, priority will be given when the two labs are ENOVA members. The home institution is the institution/organisation where the STSM applicant holds their primary affiliation as registered on their e-COST profile/STSM application /C.V. and where they are currently performing their main strand of research. The host institution concerns the institution/organisation that will host the successful applicant. 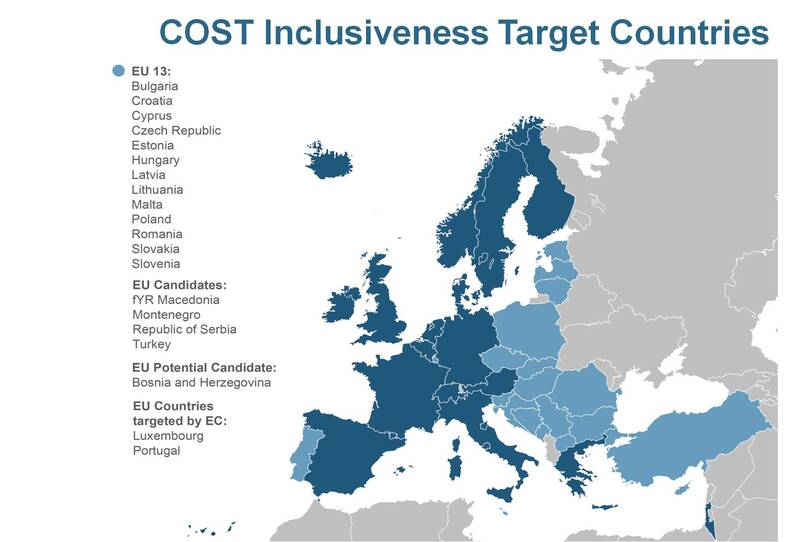 Applicants coming from Inclusiveness Target Countries (ITCs) that are ENOVA member (Bosnia-Herzegovina, Bulgaria, Estonia, Croatia, Latvia, Montenegro, Poland, Portugal, Slovenia, Slovakia, the former Yugoslav Republic of Macedonia, Republic of Serbia and Turkey) will be also given priority. The STSM should contribute to the scientific objectives of ENOVA. The selection of applicants is based on the scientific aims and scope of the STSM application which must clearly compliment the overall objectives of ENOVA. STSM should provide added value to ENOVA. Quality of the applicant based on the written application. Gender balance will be taken into consideration. Candidate ranking will be done by summing up the scores of the whole research proposal and its individual parts (see below) on a 0-3 scale (3 = outstanding, 2 = excellent, 1 = average, 0 = insufficient). Selection will be done by the STSM Coordinator, Co-Coordinator and STSM Committee in conjunction with ENOVA Core Group. Funding rule in section 7 of the COST Vademecum. The grant will be reimbursed AFTER the Grantee has completed her/his visit and submitted a report (a written report on the activities carried out during the STSM within 30 calendar days of the end of the research visit). Researchers from Participating Inclusiveness Target Country can receive 50% of the grant upon completion of the 1st day of the STSM. The remaining 50% will be paid after the Grantee has completed her/his visit and submitted a report. Note: STSM grantees must make their own arrangements for all provisions related to personal security, health, social security and pension matters.